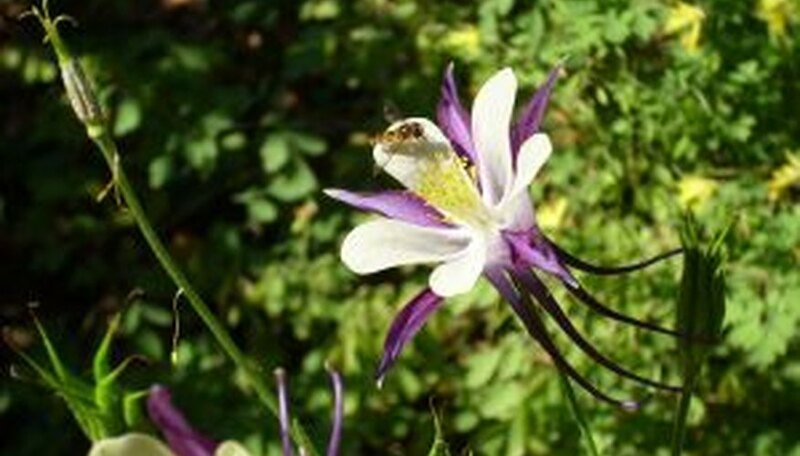 Prized for its bicolor blooms, columbine requires very little maintenance to stay healthy. While an end-of-season pruning will help prevent disease and encourage growth next spring, other pruning decisions will depend on your goals for the plants. Summer removal of spent blooms, known as deadheading, will result in larger blooms next year. Refraining from summer pruning will mean smaller flowers, but more of them as they further seed the bed. A happy medium is to prune most of the spent flowers but leave a few to go to seed. Snip off dead or damaged leaves throughout the growing season. Use a sharp pair of gardening scissors or shears. Snip off the leaf where it joins the main stem. Cut off spent blooms if desired. Snip terminal flowers--the blooms at the top of the central stem--1/4 inch above the nearest leaf set. Snip off spent lateral flowers where their stems join the main stem of the plant. If the terminal bloom is already removed and the spent lateral is above a second healthy lateral flower on the main stem, cut the main stem to just above where the lowest healthy flower joins it. Prune the plant down to its basal set of leaves in the fall. Basal leaves are the larger leaves at the base of the columbine that emerge from the stem near soil level. This encourages the columbine to produce more roots as opposed to sending nutrients to stems that are no longer producing flowers. Cut back the columbine to the basal leaves early in the season to combat mold and mildew. The plant may be able to rally and produce a few more blooms before the season is over. Save columbine seeds and scatter them over spring bulb beds. Columbine adds color after the bulbs have stopped flowering. Flower buds resemble seed heads. Be careful not to accidentally remove the buds.